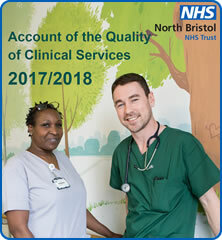 North Bristol NHS Trust is a provider of local hospital services and complex specialist care for a large population in the South West of England. Employing over 8,000 highly skilled and caring staff, we aim to deliver excellent clinical outcomes and a great experience for all service users. Our aim is to provide our patients with best practice, high quality care and treatment that is comparable to the best in the world. As one of the largest hospital trusts in the UK we treat some of the most difficult medical conditions in an increasingly complex patient population. We want to care for our patients in a safe environment and ensure that everyone has an outstanding experience. During 2017/18, the Trust provided a wide range of NHS services. These are listed in Appendix 3.